Malty sweetness on the nose, together with some biscuit, vanilla and brown bread. Then slightly fruity with plums, accompanied by some spicy notes of ginger and pepper, followed by a touch of nougat in the back. Nicely sweet on the palate with biscuits, malted barley and creamy vanilla. A touch of fruitiness is shining through with red apples, followed by spicy notes of black pepper and ginger. 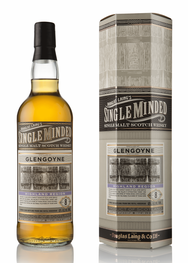 The finish is medium long, slightly warm and sweet with honey and malted barley. Becomes drier on the tail with subtle oak and cinnamon. There's more vanilla coming through when a few drops of water are added. Still sweet and less spicy. Still sweet on the palate, too, but the spiciness soon takes over with black pepper, ginger and anise. Creamy notes of vanilla linger towards the finish. The finish is a bit shorter with slightly warming notes of oak spice, anise, sweet barley notes and subtle creamy vanilla. A nice, malty-sweet and at the same time spicy all day dram. Not overly complex, but clean, straightforward and finely structured. Despite the "only" 43% abv it is very present on the palate. Delicious and good value for money.